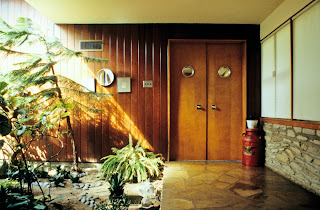 Harris Armstrong's Evens Residence of 1951 (copyright © Raimist 2012). The Evens Residence in Ladue is one of Harris Armstrong's most coherent, substantial and elegant expressions of passive solar residential design. 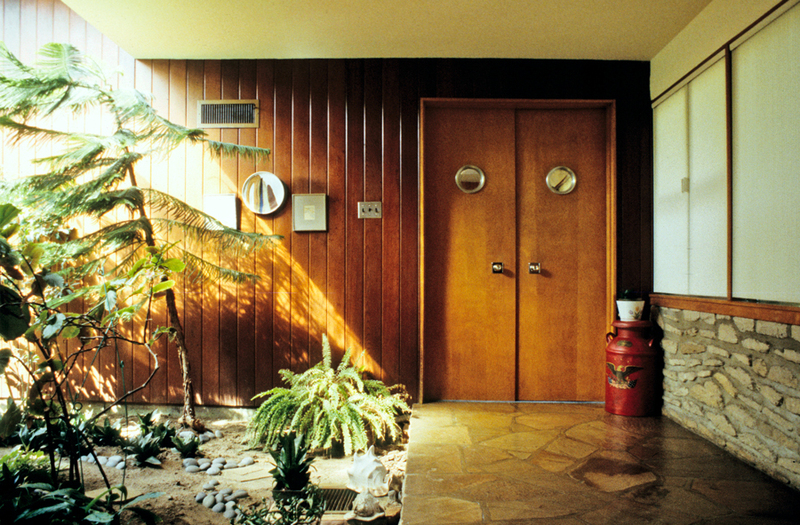 Built in 1951, the house is oriented south with large full-height glazing in all of the principle room. Cantilevered overhangs are designed to protect the glazing from the midday summer sun and to admit the lower warming rays of the sun in winter. Armstrong carefully manipulated the house’s form using a butterfly roof (shaped as an inverted 'V') eliminating the distracting visual clutter of gutters and downspouts. 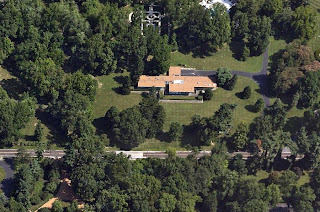 Aerial photograph of property at 9999 Litzsinger Road (courtesy of Google Maps). This home, presently for sale, is located in the heart of Ladue at 9999 Litzsinger Road near its intersection with Warson Road. The house is set within a verdant landscape featuring expansive lawns and mature trees. The house is set back from the street on the rise of a gradually upward sloping lawn. An over-sized terrace wraps the central section of the house providing a perfect setting for large scale outdoor events. Landscaping and stone retaining walls are arrayed to provide visual privacy from the street. 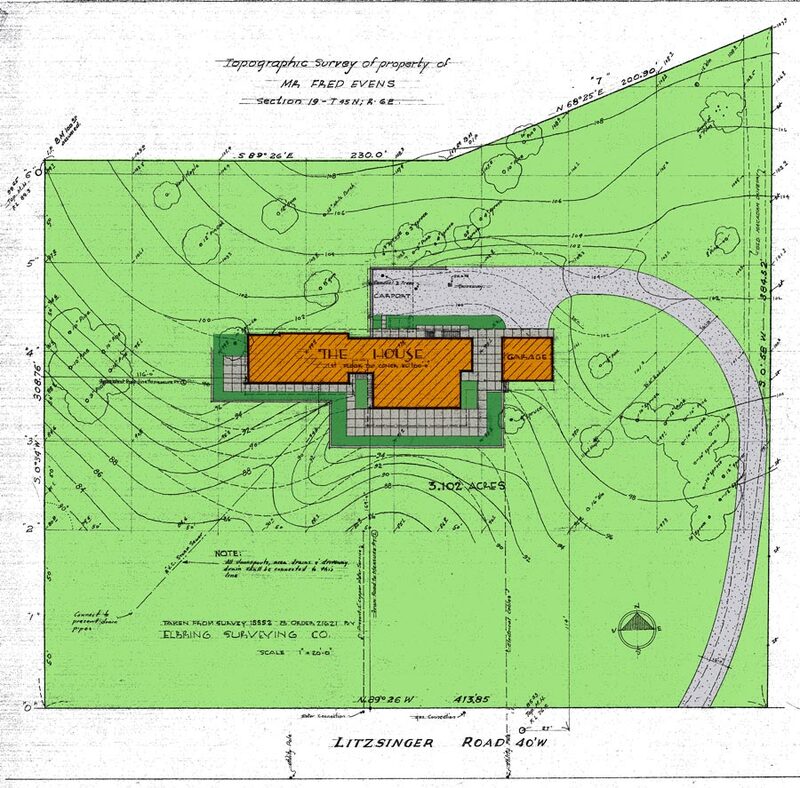 Armstrong's site plan directs vehicles to the north side and reveals paved terrace to the south. (Harris Armstrong Archives, Special Collections, Washington University in St. Louis; color added by Raimist for clarity). The home's structure is solid and permanent – virtually indestructible. An exposed framework of steel embraces concrete slabs making the house remarkably resilient. The inward sloping roofs are supported by open web steel joists not visible from the interior, but exposed on the exterior as rafter tails. Their rhythm suggests a modernist invocation of delicate structural dentils (a decorative embellishment which originally referenced the exposed ends of roof purlins). 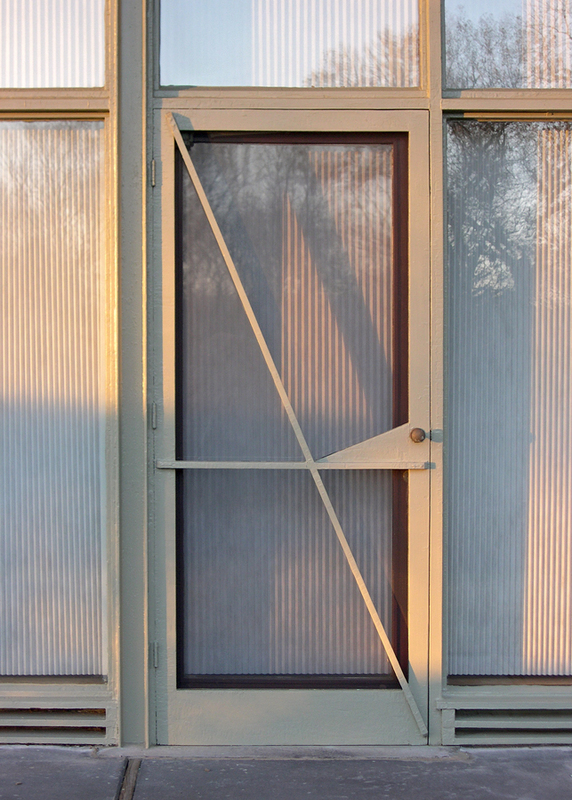 Armstrong takes advantage of the steel structure to simultaneously open up the house to the landscape while maintaining a visceral sense of enclosure and protection. Exterior of garage (copyright © Raimist 2012). The house is positioned near the center of the three acre parcel with a gradually curved driveway providing access to the series of garages and free-standing carport. The home was originally designed and built for Fred Evens (pronounced "Evans") in 1951, the owner of a St. Louis Ford automobile dealership in midtown. While the design makes no direct form references to cars, it is absolutely a product of the mid-century culture which prized impressive cars and open plan modern homes. The carport may be the most beautiful and substantial structures of its kind. It is generously proportioned and created with the expressed notion of showing off the owner's latest model. 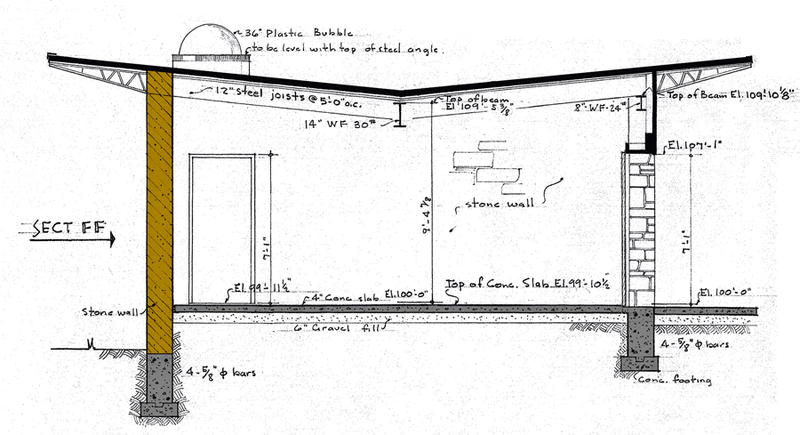 Section through garage reveals solid stone masonry, open web bar joist roof structure, butterfly roof and dome skylight (Harris Armstrong Archives, Special Collections, Washington University in St. Louis; color and tone added by Raimist for clarity). The northern portion houses the more functional areas of the house including the garages, bathrooms and kitchen. Spherical domed skylights (inspired by WWII B-17 "Flying Fortress" bombers) are positioned along this section to provide additional diffused natural light where direct sunlight is unavailable via the glazing. 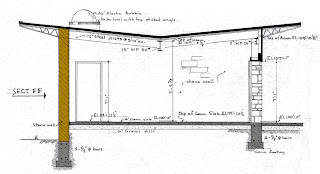 Armstrong kept the roof overhang on the north side of the house shallower to admit more light while still protecting the surface from excessive weathering. 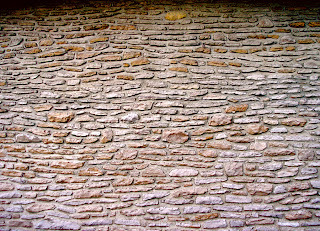 Unique stone masonry features undulating, naturalistic coursing (copyright © Raimist 2012). Natural materials are liberally deployed alleviating any concerns that this modern home of concrete and steel might be cold and forbidding. Quite the contrary, the house is inviting, informal and open in its planning and liberal in its use of wood, stone, plants, grass cloth and other warmly evocative finishes. Harris Armstrong's perspective rendering of the house with spacious terrace (published in Arts and Architecture, v. 68, January 1951, pp. 36-37). The striking entry foyer is filled with natural plantings and abundant sunlight. This notion of incorporating landscapes as significant elements within a structure was a signature of Armstrong's approach to uniting inside and outside. 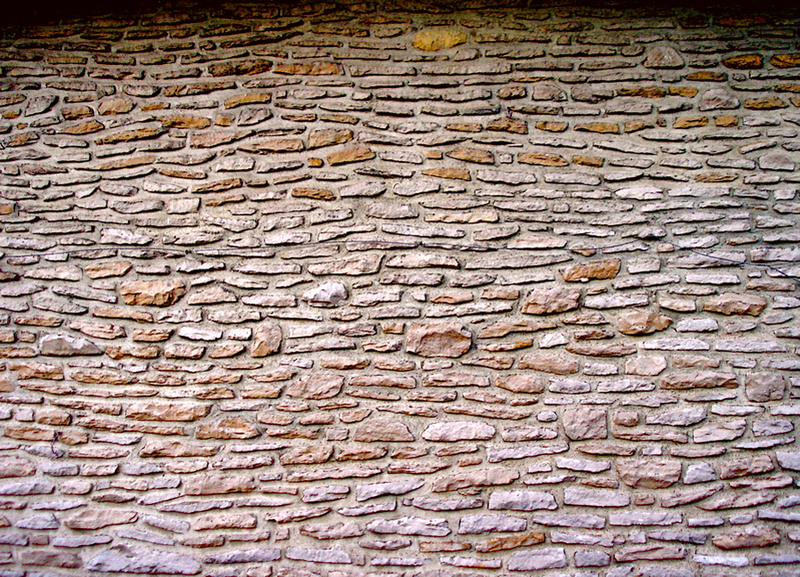 The exterior stacked limestone visible on the exterior walls and retaining walls appear within along with beautifully selected and positioned paving stones which fill the central portion of the house, linking the public and private areas, as well as connecting to the striking circular stone stair positioned directly behind the massive stone masonry chimney. 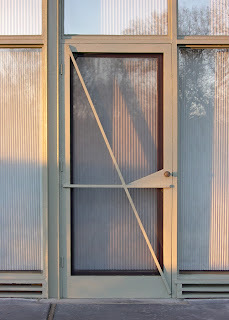 Three screen doors from the Great Room feature Armstrong's signature "HA" door (copyright © Raimist 2012). 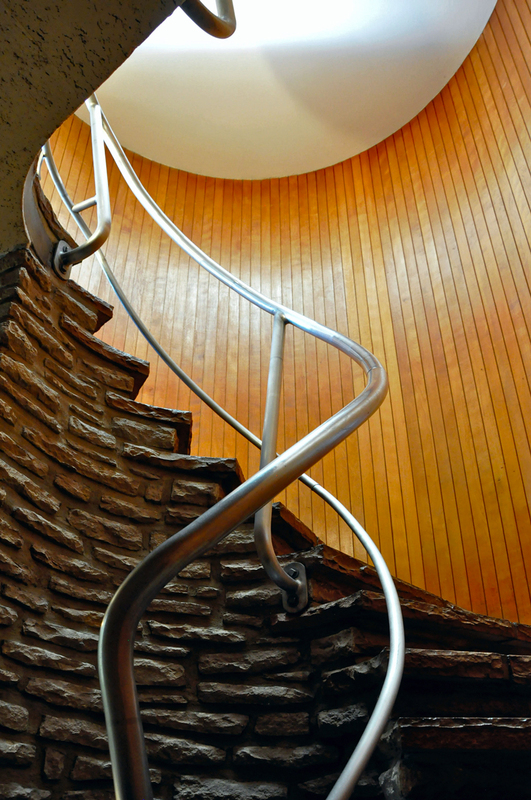 The stone spiral staircase is a tour-de-force of craftsmanship joining stone treads and risers with custom-formed aluminum (with a striking '50's retro form) and encasing vertical wood strips. The cylinder lining meets the stone treads directly without any intervening molding. 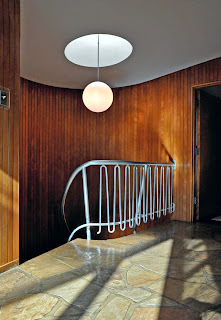 A central skylight and globe fixture are located appropriately over the spiral's central axis. Entry Hall with indoor garden, skylights and doors to bedroom wing (copyright © Raimist 2012). 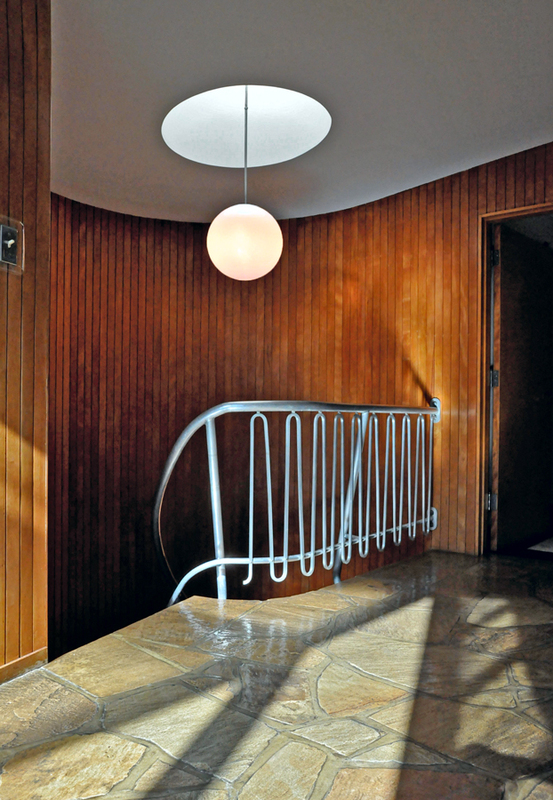 The spiral stair accesses the lower level recreation room which is paved in terrazzo and includes inlaid shuffleboard and an authentic 50's bar. This level connects to the exterior via a short, mysterious tunnel to provide access to a swimming pool (never installed). Stone spiral stair hidden behind massive stone chimney (copyright © Raimist 2012). 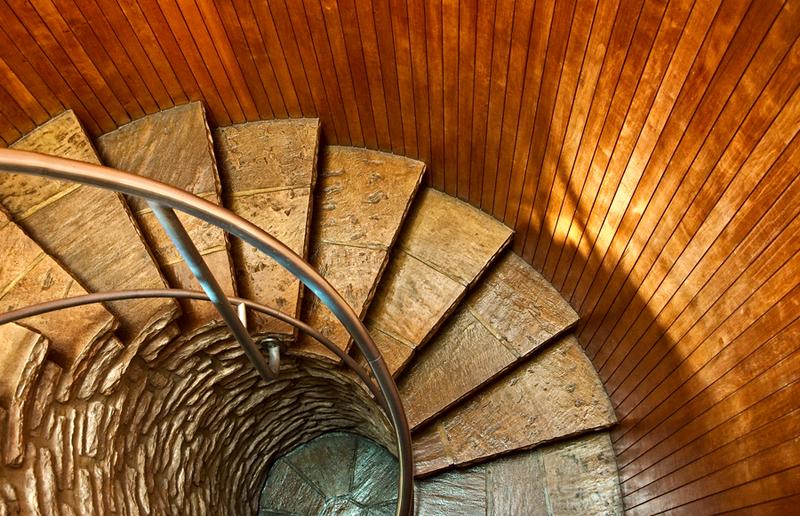 The stair is richly defined by carefully stacked stones, vertical strips of stained wood, a central skylight, globe light and a gracious, custom-designed aluminum railing. These elements are assembled in a pure, minimalist way without moldings and other devices to conceal joints between dissimilar materials (as is so common today). This element exhibits the high level of craftsmanship found throughout the home. This emphasis on simplicity and honesty is clearly derived from a consistent philosophical proposition which is carried through completely in the house's original design and construction. Fortunately very little of the original material has been modified making this an exquisite example of Armstrong's residential work at its zenith. 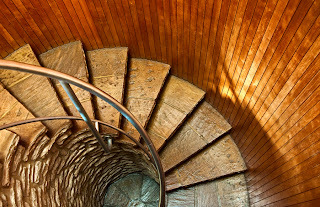 Stone spiral stair, view down from railing above (copyright © Raimist 2012). Gazing back up into the spiral stair which is flooded with natural light, one senses a moment in space and time of pure architectural poetry just beyond our grasp. Stone spiral stair, view up from lower level (copyright © Raimist 2012). 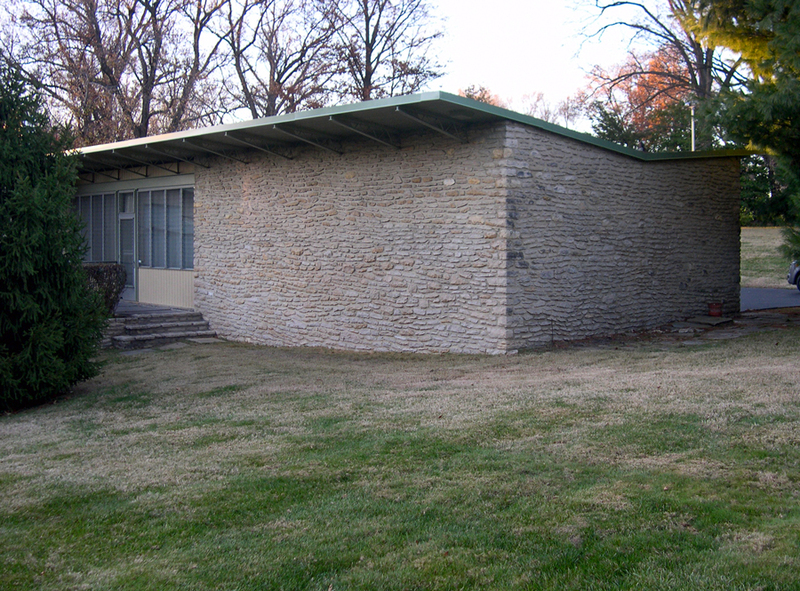 The Evens Residence and Morton D. May House were identified by St. Louis Post-Dispatch architecture critic Frank Peters as modernist landmarks at a critical juncture in 1987. At the time, these two expansive structures (located just around the corner from one another) were potentially endangered. 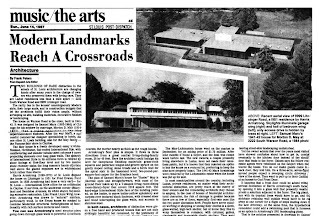 In the years since, the Morton May House was demolished despite a valiant effort to rescue it from the wrecking ball by an ad hoc consortium of St. Louis advocates for modernism. Their generous offer was rejected and a monumentally scaled French Chateau 'McMansion' was built in its place. Without the right buyer who appreciates the character and quality of this home, it too could become just a memory. 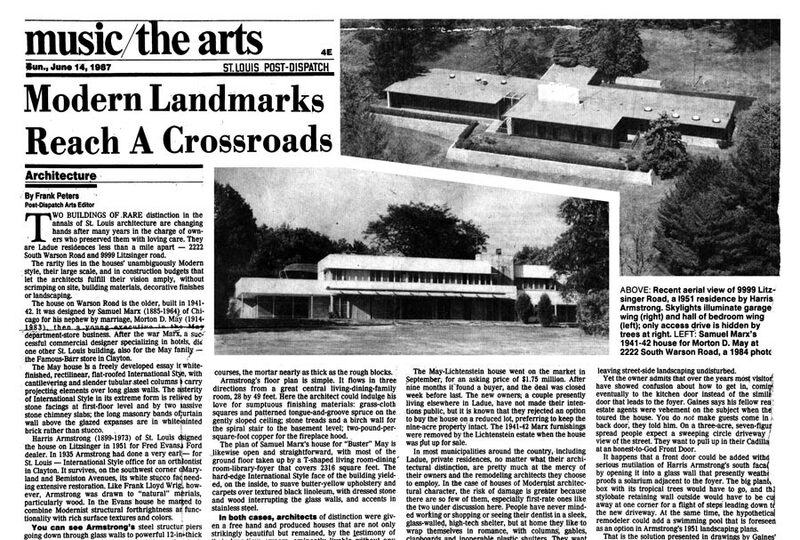 Frank Peters article on Evens Residence and Morton May House, St. Louis Post-Dispatch (Sunday, June 14, 1987). This property is listed with Gina Bundy of Gladys Manion Real Estate.